The Stedelijk Museum is pleased to present Joy Mariama Smith’s performance Fou Fou as part of the exhibition Freedom of Movement. Joy Mariama Smith creates spaces in which visitors are invited to investigate questions of identity and access. Their* newly commissioned performance Fou Fou uses the American children’s song “Little Bunny Foo Foo” to examine the thin line between personal freedom and oppression. The song describes a rabbit who harasses field mice by hitting them on the head until the creature is eventually punished by a fairy. The oblivious manner in which the rabbit inflicts violence on the field mice—and its refusal to acknowledge or rectify any wrongdoing—effectively safeguards its sense of entitlement in acting this way. By abstracting the song’s narrative, Smith uses it as an allegory to investigate how all of us are implicated in violent constructions of freedom. Joy Mariama Smith, ‘Free Fou Fou’, 2018, mixed media, courtesy the artist. Illustratie: Sarah Maloney. In the interactive performance, Smith invites the audience to contemplate their own relationship with freedom, agency, and identity as they relate to performing bodies. 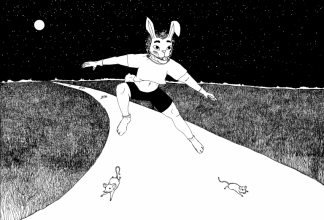 As the rabbit, field mice, and fairy continually interact, viewers are asked to move, turn, stand back to back, and accept, reject, or transcend certain ideas of freedom in order to raise awareness around their own tendencies, habits, and biases. Within this work, Smith also considers how agency and access are negotiated in the museum, a public space where certain groups are less represented than others. The issues raised by a seemingly insignificant children’s song reveals how deeply ingrained oppression and privilege are in the fabric of Western cultures. *They/them/their: third-person singular gender-neutral pronoun.